Here are all of our battery-saving tips gathered from years of experience and feedback from our members. All these tips apply to iPhone and Android devices. If there is only one tip you take away from this article: Keep your screen off as much as possible. It doesn’t matter which GPS app you use or which device you are running, but your device’s screen is by far the number one consumer of power above any app you could use. You can still navigate with the turn-by-turn voice navigation. If you have your phone mounted on your handlebars, the cues will turn the screen on just long enough to read the cues over the lock-screen then the screen will go back to sleep. When riding in a noisy environment, we recommend using an external bluetooth speaker or bone-conducting headphones that will allow you to hear your environment while still being able to hear the turn-by-turn cues. Put your device into airplane mode, especially in remote areas. If you end up riding in remote areas where cellular network signal can be touch-and-go, then your phone will expend a lot of power trying to reconnect to LTE networks when none are available. This can drain your battery pretty quickly when you are on the edge of a remote network so it connects and disconnects repeatedly through the day. Keeping your phone in Airplane mode when you don’t need a connection keeps ALL apps from trying to connect to the network and eating battery in the background. Before taking off on your ride, use the Offline Maps feature to pre-download your entire route and surrounding map tiles. This way you can still reference your route while in airplane mode which will save on battery run-time. Live Logging is a great feature that allows you to share your ride and current location with friends and family, but there’s always trade-offs between using features and maximizing run-time. We recommend not using Live Logging in areas where you may not have good, reliable cell signal. Every time the app tries to broadcast your Live Log, it has to boost power to the radio that contacts the cell towers therefore draining your battery quicker. However, in more urban settings that have cell towers everywhere then you can use Live Logging while minimizing the amount of power it uses. Although Bluetooth devices are generally very low energy use, it still takes some power to use extra sensors or transmit to a speaker/headphones. 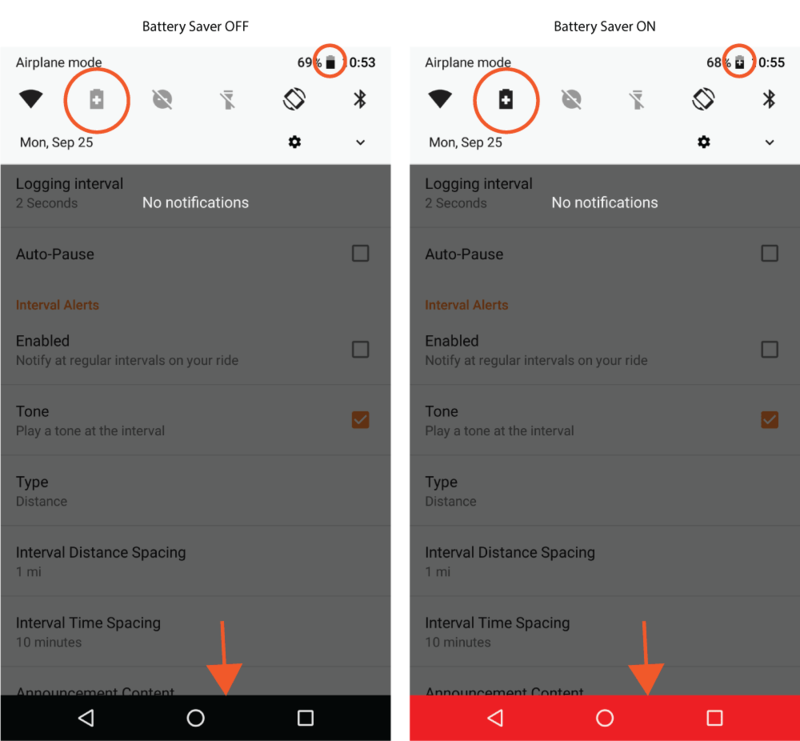 In general, keeping Bluetooth on is negligible in terms of power usage, but anyone that is trying to get last minute of power out of their battery should limit Bluetooth usage. This includes using NFC for Android devices or Wifi. Every time you transmit something wirelessly you are using power. Listening for Bluetooth sensors will use even less power than transmitting to Bluetooth speakers, but it all still takes power. There are hundreds if not thousands of models of battery packs that you can purchase to recharge your device on the go. We don’t have any specific recommendations but we can recommend getting a battery pack that can charge your phone at least one full charge, preferably more if you are on a multi-day tour or have very limited access to power outlets. Some riders also use dynamo hubs from Shimano, Schmidt, or Precision Shutter along with a USB adapter to charge their phones while they pedal. This solution works on those long rides with more consistent speeds rather than the casual ride with a lot of stop and go. It seems contrary, but disabling any power saving apps will keep the Ride with GPS app working the way it was design therefore you’ll get an accurate track and maximize your runtime. Make sure the Battery Saver options is OFF.